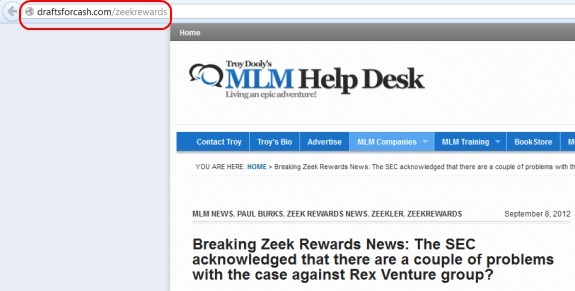 Various efforts to mislead Zeek members and the public about the SEC’s Aug. 17 action against Zeek Rewards amid allegations that Zeek was a $600 million Ponzi- and pyramid fraud now are under way online. If you’ve received an email attributed to Zeek member Dave Kettner that claims “[t]he SEC acknowledged that there are a couple of problems with the case against Zeek Rewards and Rex Venture group,” it almost certainly is best to be extremely skeptical of the claims. Similar claims were made by apologists for the AdSurfDaily Ponzi scheme. We (the SEC) are not able to find a victim in this case. We are not able to find anybody at this time that has been harmed by Zeek Rewards. We (the SEC) are having a hard time finding a security. In the complaint, it said that Zeek was selling securities and was an investment scheme. Beginning in August 2009, dozens of AdSurfDaily members flooded the docket of U.S. District Judge Rosemary Collyer with claims the government had produced no “VICTIMS” in the ASD Ponzi case. The pleadings appear to have been based on a template shared by one or more ASD downline groups. Included among the filers was Todd Disner, then an emerging figure in the ASD story and now an emerging figure in the Zeek story. Collyer rejected each and every one of the claims. In September 2011, the U.S. government announced it had identified at least 8,400 ASD victims. Two months later — in November 2011 — Disner filed a lawsuit against the government that alleged it had produced a “tissue of lies” and that ASD was a legitimate enterprise. About seven months later — in May 2012 — ASD operator Andy Bowdoin pleaded guilty to wire fraud and admitted ASD was a Ponzi scheme and that the company never had operated lawfully. The government now says it has identified at least 9,000 ASD victims. Justia.com has archived Collyer’s ASD docket and the related filings here. Disner’s unsuccessful filing is Docket No. 91. The ruling rejecting his claim (and others) is Docket No. 96. Despite the denials, other ASD members continued to use the same no “VICTIMS” argument, which incorporated a conspiracy theory that government evil was afoot. Collyer eventually issued en masse denials. Disner, Kettner and Zeek figure Robert Craddock are known to be involved in an effort to raise funds purportedly to defend Zeek affiliates while taking the SEC to task. The effort has been marked by shifting stories, contributing to an atmosphere of confusion. PP Blog guest columnist Gregg Evans wrote about some of that confusion here. The SNR Denton law firm, once presented by Craddock as the attorneys for Zeek affiliates, now appears to have withdrawn its representation. Meanwhile, a website known as ZTeamBiz that was gathering funds for the purported Zeek defense has been blocked by PayPal, a development ZTeamBiz blamed on purported fear of competition by eBay. eBay owns PayPal. RealScam.com (GlimDropper) now is reporting that ZTeamBiz is soliciting money via “electronic check drafts” and potentially putting contributors’ banking information at risk. Meanwhile, it’s worth pointing out that the U.S. Secret Service confirmed on Aug. 17 that it was investigating Zeek. Beyond that, the office of North Carolina Attorney General Roy Cooper has confirmed it is investigating Zeek. At least two proposed class-action lawsuits also have been filed against Zeek. The SEC is hardly Zeek’s only worry. "freezeekler," a MoneyMakerGroup Ponzi forum poster in the "ProfitClicking" thread, is using his (or her) forum signature to help disinformation about Zeek spread online. ProfitClicking may have ties to the "sovereign citizens" movement. The redirect from the signature of "freezeekler" at the MoneyMakerGroup Ponzi forum causes Troy Dooly's MLMHelpDesk.com Blog to load under a URL styled "draftsforcash.com." On the MoneyMakerGroup Ponzi forum, "freezeekler" says his (or her) plan with the "ProfitClicking" program is to "withdraw at least until I have my investment back." UPDATED 10:24 P.M. EDT (U.S.A.) TO ADD FIRST COMMENT FROM TROY DOOLY. UPDATED AT 11:25 P.M. TO REFLECT COMMENT FROM DOOLY THAT THE OFFENDING PAGE DESCRIBED BELOW HAS BEEN REMOVED. UPDATED 9:13 A.M. (SEPT. 10) TO FIX REDUNDANCY IN THIRD PARAGRAPH. Hot! ZEEK REWARDS Coming Back, NOT GUILTY? NEW updated information! MoneyMakerGroup is listed in U.S. federal court filings as a place from which Ponzi schemes are promoted. Records show that five major scams promoted on the forum in recent years — Zeek, AdSurfDaily, Legisi, Pathway To Prosperity and Imperia Invest IBC — allegedly gathered a combined sum of at least $868 million. By contrast, the 2013 budget for the city of Las Vegas is $468.8 million, according to a May report in the Las Vegas Sun. The population of Las Vegas is approximately 590,000. In terms of the number of victims — currently estimated at between 1 million and 2 million — Zeek may be the largest Ponzi scheme ever investigated by U.S. law enforcement. Its membership base may be at least 10 times larger than ASD, whose base was estimated by the U.S. Department of Justice at 97,000. Zeek’s estimated cash-drawing power of $600 million appears to have been approximately five times larger than ASD’s. When “freezeekler’s” signature link is clicked, a redirect kicks in and visitors are taken to a URL styled “draftsforcash.com” and a page styled “zeekrewards.” (draftsforcash.com/zeekrewards.) When visitors move their mouse, a lead-capture ad then loads for a 60-minute “webinar” for an unspecified program that asks viewers to submit their name, email address and phone number. Dooly tonight expressed concern about the Ponzi-forum development. In a second email to the Blog, Dooly said his company took quick action to ensure the offending page was taken down. “My COO jumped on the issue as soon as I sent it to him,” Dooly said. ProfitClicking is an ASD-like autosurf formed from the carcass of the JSS Tripler/JustBeenPaid “program” that suddenly went missing last month amid reports of the sudden “retirement” of Frederick Mann, the purported operator of JSS/JBP. Mann is a former pitchman for the ASD Ponzi scheme. JSS/JBP claimed to have more than 1 million members. Its cash-sucking power remains unclear. That’s known as a URL-hiding forwarder. Basically the entire page is an “iframe” that loads a different page, but it’s not a true forward-to-another-site. Patrick thank you for bring this to my attention. Below is an email thread that went between my COO and the above mentioned website. Thank you for taking care of this so fast for us, We have no issues with you linking to our site as long as you do not mask our domain and the posts link back to the original source. Again, thank you for bringing this to my attention! That was included in an early solicitation for contributions to the Disner/Craddock/Kettner claw back defense fund. To be clear the e-mail wasn’t from Dave or Robert but rather from the person who’s name is in the frame. I had problems connecting here earlier today (I got a database error). Now, RealScam and BehindMLM are also experiencing errors. I wonder if there’s a DDoS attack going on. Thank you! We’re on it. We removed (made inoperative) the link ibourl.net/troy2 as you requested. I thoroughly confirm that GoDaddy was attacked today (or hacked) I was trying to forward a Distributors Rights Association URL. I got mad and stayed on the phone and when I got a human there was desperation in his voice! And I got no results! And thank you to Marley, I got home from work and not only was RealScam down but ironically the wesite I use to see if it’s “down for everyone or just me” dot com was down. You saved me anxiety.